I got a late start tonight so this will be an especially abbreviated post. I think this one speaks for itself. Watermelon. I love painting stuff that's red. If you'd like to bid on this painting you can access the auction by clicking here. 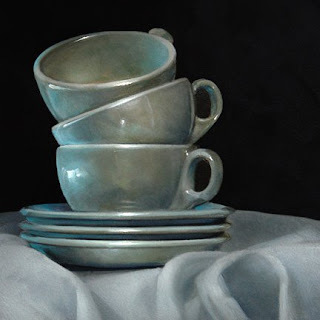 Tonight is a variation on a composition I posted a while back called Stacked Cups. I really liked the original, and knew at the time that I'd revisit it down the line. 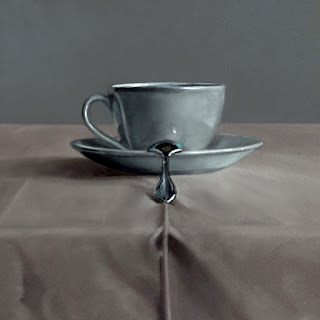 The combination of the hard reflective surface of the cups and saucers, with the draped linen table cloth is very appealing to me, so it tends to show up in a lot of my paintings. If you would like to purchase this piece you can bid on it by clicking here. As I mentioned in an earlier post I've been working on the photography for the Chicago commission this week. I've got compositions for three of the four required paintings. I'm still waiting for my last prop to arrive from ebay to complete the fourth. I have to say that I'm pretty pleased with how they are turning out. Even if the commission falls through, I think they will work very well for ebay, and gallery paintings. Either way I'm looking forward to getting them onto canvas. Some silver tonight. 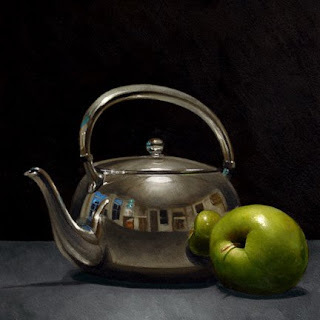 I purchased this little kettle about four years ago, and I think it has become the most painted item in our house. The shape is fantastic, and the near spherical body of the kettle gives you a wonderfully distorted view of which ever room it happens to be in. This composition was photographed very early in the morning. The dark blue coming in through the windows reflected in the surface is that of the dawn. The composition is illuminated by a single incandescent bulb inside a beautiful greek fishermans lamp hanging above our kitchen table. The apple adds some color, and an additonal reflection. To bid on this painting you can access the auction by clicking here. I've been waiting for a while now on some kind of response from the higher-ups at Print Pack about my artistic contribution to their board room. It's impossible for me to completely relax about a painting until I hear from the recipient that they are happy with the work. Today I finally got some news from Spalding. The paintings have been hung, and he says they look great. Official approval will hopefully come about thursday when the CEO returns to Atlanta, and "reviews" the completed commissioned pieces. If he is pleased, I'll consider the job complete. As I mentioned in an earlier post, there has been some scuttlebutt about the possibility of doing more paintings along these same lines. So, my pocket book, as well as my ego hopes the response is positive. I've also been busy working on photography for a potential commission in Chicago. When I have a few suitable compositions ready, I'll send those off, and keep my fingers crossed that they will be approved. There will be a significant time crunch on this one, so I hope the approval process moves quickly. I'll have another five ebay paintings going up this week. I was in the mood to do some glass, so I revisited my light bulbs. 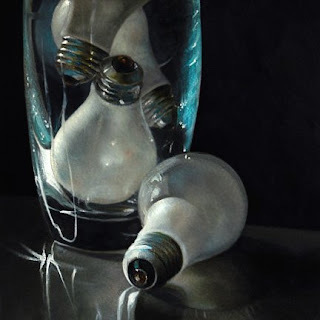 It's a tightly cropped portion of a glass vase filled with light bulbs sitting on a stainless steel table. Other materials to be represented this week will include; china, silver and plastic. Watermelon will finish off the week. If you'd like to bid on this painting you can participate in the auction by clicking here. To those of you who follow my blog, it will be no surprise to read that Karin Jurick is one of my closest friends. I rarely miss an opportunity to mention it. 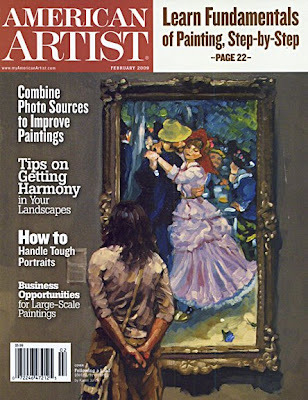 Today I'm busting because her work is on the cover of the current edition of American Artist Magazine. The cover! Not to mention the eleven paintings on four pages within the issue. If by chance you haven't already seen her work you should really visit her website. I think she's one of the most talented artists out there, and I love the fact that she is getting this great exposure. If you'd like to read the entire article, and see all of the paintings you can view it by clicking here. 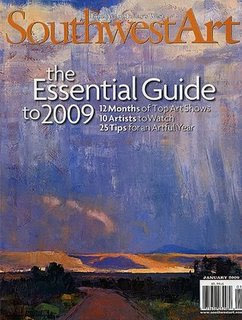 In addition to the AA article, her second blog, Different Strokes from Different Folks is currently featured in SouthwestArt's: Essential Guide to 2009. The story of the creation of that blog, and it's amazing growth in popularity is an interesting one. You can read that story in Karin's primary blog, A Painting Today. 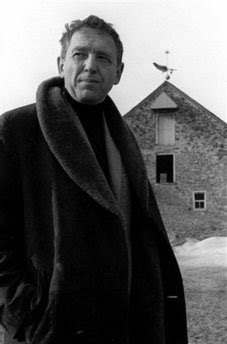 Like many artists, and fans around the world, I've been reflecting on how important Andrew Wyeth's paintings have been to me. I discovered his work when I was in my late teens, and it's been a part of my life ever since. In the last two days I've been writing and editing my thoughts, for a post on my blog, but kept coming up short. Nothing I wrote seemed to honestly express my feelings, so I decided to just create a short slide show of some of my favorite paintings, and let it go at that. 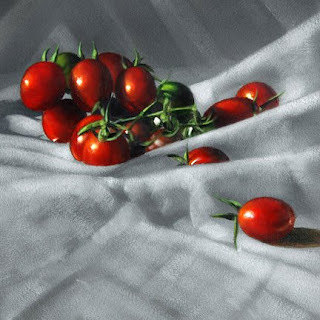 Continuing the food theme for this week with a few grape tomatoes. I guess that's about all there is to say about that. I'll be delivering the Print Pack commissioned paintings tomorrow morning. I'm kind of freaked out about it. I've been emailing jpegs of each to them for approval, but I'm still a little worried about bringing in the actual completed paintings. Not sure how they'll react. Hope all goes well. If you'd like to buy this painting, you can participate in the auction by clicking here. Number three for ebay this week is one of my favorite subjects. The cup and spoon. I've been working to achieve that wonderful translucent quality of china in my paintings for quite some time now. I haven't quite gotten it yet. I can usually get close, and occasionally real close. Duane Keiser nails it every time with his ceramic subjects, a fact that elicits much envy in me. Having said that, I do like how this painting has turned out even though the posted image is not that great. 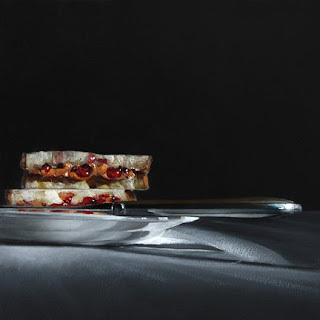 I was writing to a fellow artist, Paul Brown, just this morning in fact about the difficulty in photographing finished paintings. How hard it is to get a reproduction that honestly represents the piece. 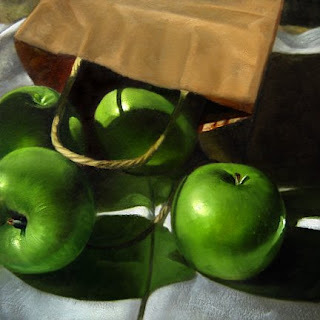 Some paintings photograph beautifully, while others are a real challenge. I don't know if it's just me, but it seems my favorite paintings are usually the most difficult to photograph accurately. Maybe my expectations for those is just higher. If you'd like to purchase this painting, you can access the auction by clicking here. Rarely a day goes by that I don't eat a granny smith apple, so I thought I'd add these to this weeks ebay offerings. I love their crunchy sour taste, and I love the way they look. Apple Bag No.2 continues a food related theme I seem to have adopted this week. 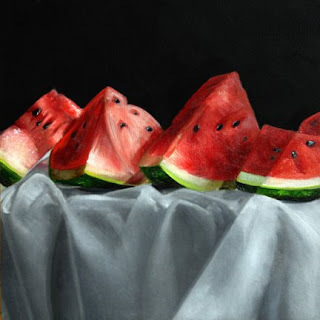 All but one of the five paintings portrays edible items. If you'd like to bid on this painting, you can access the auction by clicking here. Upon completion of my final commissioned painting I re-entered the ebay market. In an odd reversal of comfort zones, I've gone from 30 x 30's back to what was, at one time, the norm of the 6 x 6. I have to admit it feels a little weird. That sense of immediate gratification has returned, but it still seems a bit strange to work on such small panels once again. I'll be getting back to gallery work as well, once these are done. I plan to list five small ebay paintings this week, then it's back to larger pieces for the galleries. If you're interested in bidding on this painting you can access the auction by clicking here.